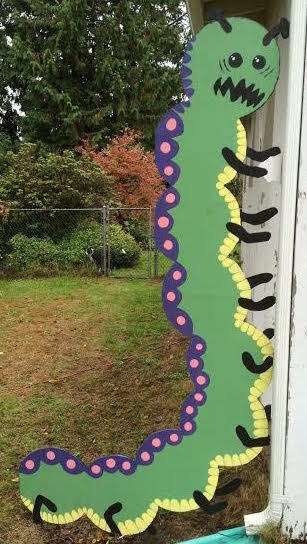 The idea for the monster caterpillar came from one of the kid’s drawings. I went looking for it, but am not sure where it went. Usually, the drawings that are used for Halloween decorations end up tacked on the garage wall somewhere or other, but it’s not there. Nor is it in my other file of potential Halloween decorations. As usual, the original version was done rather last minute, so the overall look was a bit rushed. It was also made out of a partially-used piece of plywood, accounting for some of the odd shapes. At the time I first made it, I posted a picture of it online, leading a co-worker to ask, “What is it?” That interaction led me to be deeply concerned with higher education in the U.S.A. 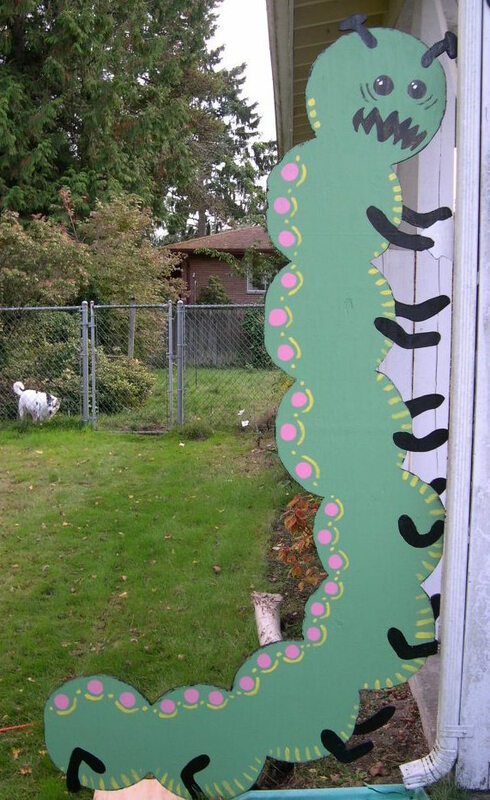 If a person with an advanced degree cannot readily identify giant, house-eating caterpillars, then we are truly doomed. But I digress. The original, rushed version, with our vicious guard dog looking on. The caterpillar needed some fresh paint, so I made it look a bit more like I originally wanted. With some fresh paint, and our vicious guard dog nowhere to be seen. A lot of the tombstones were looking pretty shabby. Also, I still had some store-bought, styrofoam ones that I managed to patch up and keep using over the years. So, I decided it was time to get the graveyard in order. The styrofoam ones are finally gone, replaced with tombstones cut from a single, heavy board. There’s one other new/replacement tombstone cut from the seat of a broken down dining room chair. The rest–taken from a variety of different wood sources over the years–were touched up with primer, then “Make it Stone” paint, then spray sealer. The graveyard–along with Murder Teddy and the purple alligator monster that lives downstairs. The lettering is all done freehand, in a variety of styles, partially depending on how the paint, paintbrushes, and the surface is behaving, but mostly just based on me winging it and hoping I don’t screw anything up too much. The tombstones, per tradition, all involve the names of various fictional characters from books, comic books, and song. The only one not visible in the picture (blocked by a zombie) is Caddy Compson. But first, all of the tombstones and zombies got fitted with hinges or brackets (if they didn’t already have them) paired with a single metal rod to serve as a stake for holding them in place, then got their backs “blacked out” with a coat of primer and a layer or two of black paint. 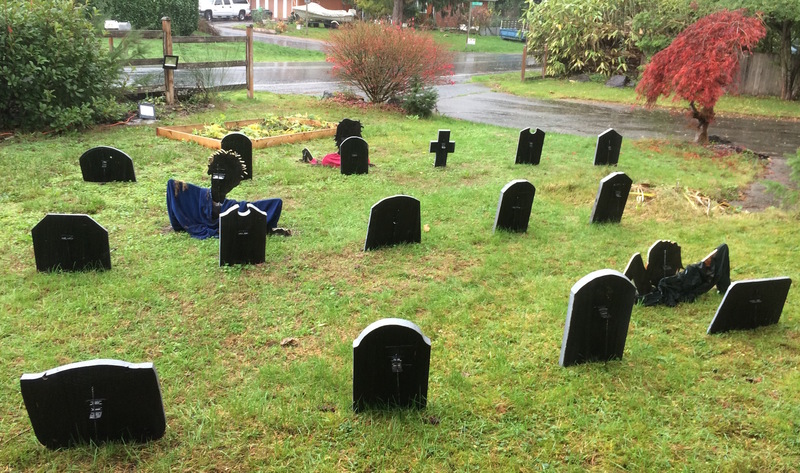 From the back–all blacked out and much less sloppy–note, I am talking about the tombstones and zombies, not the deplorable state of my landscaping. The whole process was rather involved, took several steps, and involved a lot of delightfully toxic fumes. I really should work on the tombstones in the summer, when I can more reliably use spray paint and sealer outside. I did all the spraying in our “workshop”–an added-on room where the previous owner used to work on stained glass–but which has no windows. There’s a definite trade-off between leaving the door open to air it out, and closing the door so that all the cold, wet air doesn’t prevent the paint from curing in a reasonable period of time. At any rate, I went to all that work, because previously the backs of all the pieces had a wide range of different “looks”–from bare plywood, to various colors, words, and images, from reclaimed wood. I don’t have a picture of the backs when they were in the pre-blackened state. I never thought to take one. Still, it always bothered me that when I opened the door for trick-or-treaters, and when they were walking away, we would see a whole lot of mess on the back of the tombstones, and a weird array of sticks and stakes, and wire and string. Now, it’s all more uniform, and masked much better. Fascinating, I know.